One of our regular challenge players is Margaret from Huddersfield in Yorkshire England. 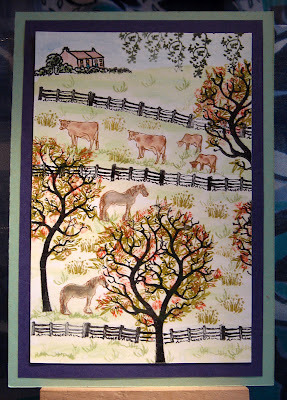 She sent me two cards for our Trees challenge. 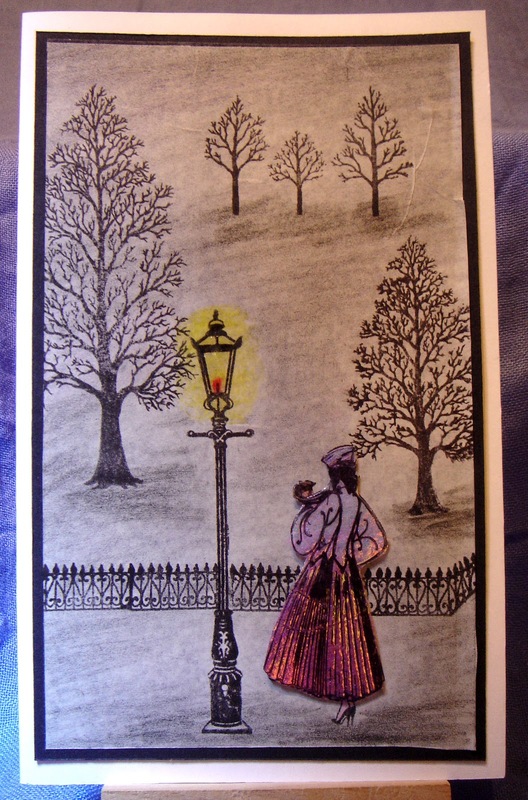 I stamped the images for the Lady in the Park on to white card using Adirondack Pitch Black. 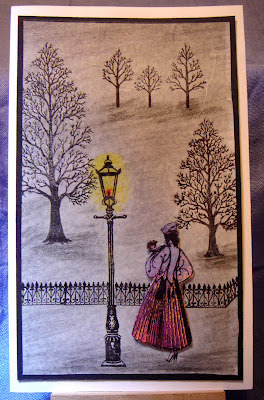 The Trees , Lamp Post and Lady are from Clarity Stamps, and the Fence is from Tanda stamps. I coloured the background using Grey, Black and a touch of Purple crayons. The lady was created using archival ink on the stamp and a sandwich of Fantasy Film and Angelina Fibres placed over the stamp and fused together using a craft iron (This is a Clarity Stamp technique, not sure if it would work with any make of stamp) This gives a multi coloured shimmer effect, which may not show up very well on the printed image, but is very effective on the card. The lady was then cut out and attached to the card with three dimensional foam pads. I used 3D Clear Gloss Finish on the window of the Lamp to give the effect of glass. The second card was created using mainly Hobby Art stamps along with the Split Tree from Clarity, which comes in two halves and can be used separately, as in the side trees or melded together to make a larger tree as the one in the centre of the card. 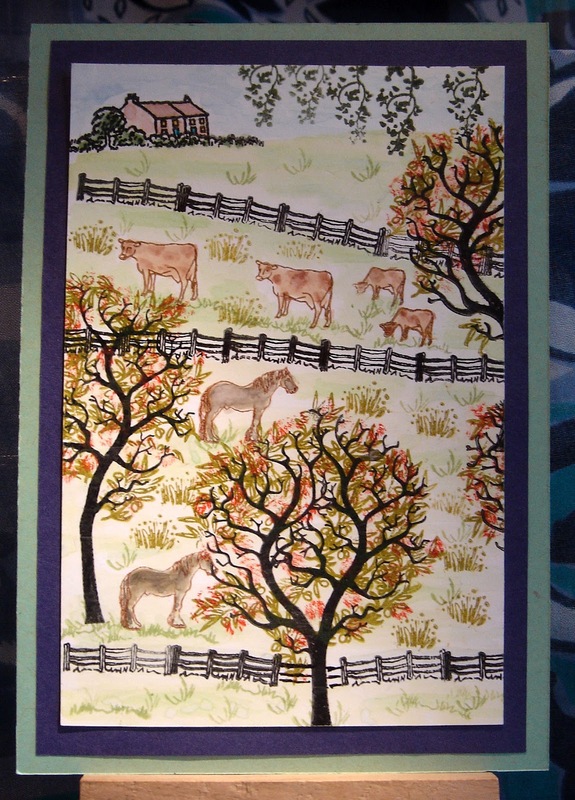 I used water colour paints to complete the scene. There are still a few days left to enter your cards in the challenge. Your projects must have at least three trees on it. You may enter up to 3 times and as many challenges as you wish. If you do not have a blog or account on Split Coast Stampers, then just email me a picture like Margaret did and I will add it to one of our posts. Don't forget to add GDT to your link if you wish to be considered for a guest spot. Click here to enter the challenge.